Endoplasmic reticulum (ER) stress is an important contributor to the pathophysiology of Inflammatory Bowel Diseases (IBDs) as well as cytokines that modulate intestinal inflammation. There is growing evidence that cytokines can interact with ER stress-specific signalling pathways, e.g. via STAT1 and STAT3 phosphorylation. In particular, Interleukin (IL)-10 suppresses ER stress in goblet cells. Regeneration processes in the intestinal epithelium can also be affected by both ER stress and cytokine signalling. Intestinal stem cells lose their proliferating properties under pathological ER stress conditions whereas some interleukines promote cell cycle via STAT3 activation. We aim to investigate whether cytokines such as IL-10 play a modulating role for ER stress in intestinal epithelial cells in IBDs, and how cytokines and ER stress interact in regard to epithelial regeneration processes. We will first perform in-vitro experiments that can show us the direction in which cytokines can modulate ER stress so as to investigate the cytokine-ER stress interaction. 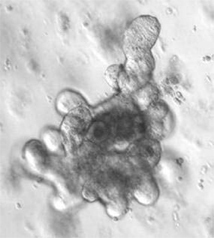 To analyze the role of this interaction in regard to epithelial regeneration, we will establish cell culture experiments as well as intestinal organoid cultures derived from primary mouse stem cells, which constitute a new tool for investigations on proliferation processes as well as a model for the gut that can be processed for cellular and molecular analysis.